A week ago the Solidarity Movement for a New Ethiopia’s Executive Team Leaders sent out an appeal to SMNE members to raise funds to send SMNE Executive Director, Mr. Obang Metho, to the Leon H. Sullivan Summit; entitled, “Africa Policy Forum: A Vision for the 21st Century,” intended to bridge the gap between Africa, the U.S. and citizens in both places. This conference, held in Atlanta, Georgia from September 24th to 28th, the invites included eight heads of African states—like President Jonathan Goodluck from Nigeria, former President John Kufour of Ghana and President Paul Kagame from Rwanda—as well as state dignitaries, celebrities, activists and delegates from Africa, America, Asia, the Caribbean and Europe. As you probably already know, the SMNE is a peoples’ movement; empowered by Ethiopians at the grassroots level. This became more evident this past week as Ethiopians from eleven different countries—such as Norway, France, the UK, Germany, Ukraine and a number of cities in Canada and United States of America made donations in varying amounts; ranging from $10 to $250 dollars. Within two days, we reached our target and by Saturday, Obang was on a plane heading to Atlanta. This was something very encouraging for all of us; showing that SMNE members are willing to back up their words of support with concrete financial help; making it possible to pursue such excellent opportunities as this proved to be! Mr. Obang wishes to greatly thank those who made this trip possible; saying he believes it was extremely worthwhile in making important connections to African Americans as well as to inform them about the truth of what is going on in Ethiopia. Mr. Obang attended most of the forums and met with some of the dignitaries and officials. He was able to speak out on a number of different occasions on behalf of Ethiopians and other Africans. Here are some of the highlights he shared. The session, “US Policy towards Africa,” focused on the Obama administration’s policy regarding Africa over the last two years. A panel of eminent persons; including such people as General William “Kip” Ward; Commander, U.S. Africa Command, John Prendergast; founder of the ENOUGH Project, Susan Paige; Deputy Assistant U.S. Secretary of State for African Affairs and others, spoke about their vision for Africa and what goals they would like to see accomplished during the next half of the Obama administration. 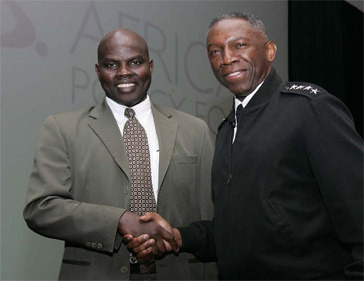 There was general agreement among them that there should be greater focus on some of Africa’s worst areas of conflict. The “hotspots” specifically named included Somalia, Darfur, Southern Sudan, the Democratic Republic of Congo and the Horn of Africa. During a very interesting discussion period that followed, Mr. Obang challenged the panel to address the current U.S. policy of investing in a dictator rather than in the people; saying that lasting peace would never come to Ethiopia, the Horn and all of Africa as long as the US held tightly to this position. He used the case of Ethiopia; particularly challenging General Ward and Deputy Assistant Susan Paige to consider how the Obama administration’s partnership with Meles in the War on Terror, resulted in turning a blind eye to how Meles was actually terrorizing his own people. Instead of reducing the risk of terrorism, such policies were actually backfiring in Ethiopia and Somalia where Meles’ brutal human rights violations were contributing to a more unstable, conflicted and radicalized Horn of Africa than ever. Another question Mr. Obang asked the panel was, “Why was there no strong condemnation by the US administration or from other donor countries to Meles’ claim of a 99.6% win in the 2010 national election?” He told them that the people of Ethiopia were ready for change; something clearly demonstrated five years ago when over two million people came out to rally in Addis Ababa during the election; however, Meles and his party had stolen the election; imposing their will on the people by force. When people came out in protest; nearly 200 were killed. Opposition leaders were arrested and the government clamped down on even more democratic rights; closing all political space before the sham 2010 election was ever held. Instead, Obang suggested that if the US really wanted to seek the best national interests of America for the long-term; American policy should support the democratic movement of the people rather than aligning with a dictator. Mr. Obang reported that the response to these comments was encouraging, but once again, we will have to wait to see what actions are taken. discussion on US policy towards the Horn of Africa and Africa. Following the presentation on International Women’s issues, a lively discussion ensured where Obang had the opportunity to ask the panel whether they knew about the political imprisonment of Ethiopian leader, Birtukan Mideksa. None indicated knowledge of her or the details of her imprisonment. Mr. Obang explained that Birtukan had been given a life sentence for simply refusing to recant her truthful statement regarding the terms of her release after being imprisoned for 20 months with other opposition leaders in the aftermath of the 2005 election. Mr. Obang shared with them how Birtukan was a young politician, a judge, a mother and the first woman ever to lead a major Ethiopian political party. He explained how she was jailed nearly two years ago after becoming an increasing threat to the Meles regime in response to her increasing popularity among Ethiopians; and as a result, her elderly mother was now raising her seven year old daughter. As Obang told them how Birtukan had found inspiration from models of justice and courage like Rosa Parks, he called those present to join with the Ethiopian people to mobilize peace-loving Americans; especially African American women, to take a stand with Birtukan. He encouraged them to work with the Ethiopian community wherever they were located, in engaging policy makers, as well as the Obama administration, to be pro-active in advocating for this pro-democratic leader, woman and mother. The response from the panel was very positive as they expressed appreciation for bringing this case to their attention; saying it was an important responsibility of Ethiopians to let them and others know about people like her so all of them could work together. Mr. Obang will follow up with this regarding some next steps to bring these groups together. 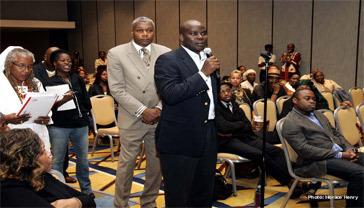 Following the session on the relationship between African Americans, Africans and Africans who have more recently arrived in the U.S., there was an emotional discussion among the audience as African Americans expressed their desire to go to Africa to help work for change or even to immigrate there more permanently, but they expressed their frustration with the many obstacles blocking the way. Mr. Obang stressed if they were to pursue this, it would be very important to work with Africans who were involved in creating good government and stronger institutions that genuinely respected the rights of the people. He emphasized that once such good government and institutions were in place, it would be much easier to deal with the immigration issues. Simply stated, African Americans needed to stand together with the people of Africa and other freedom loving people. In the specific case of Ethiopia, Obang encouraged them to engage with the Ethiopians like they did in South Africa when their united strength was much more effective in ending apartheid and bringing about a better, more equitable government. After Obang finished making some of these comments, Mr. Wahde Belay, a public relations representative from the Ethiopian Embassy in Washington D.C., stood up and publicly disputed Obang’s comments. Apparently, Mr. Belay came to Washington D.C. two months ago to assume this public relations position; which must include attending these kinds of conferences to build up their image among the American public. Mr. Belay told the audience that he disagreed with Obang and that he wanted to correct something he had said about Ethiopia. He then went on to declare, “Ethiopia is one of the most democratic countries in Africa.”He then asserted, “Corruption does not exist in our country.” Theaudible response from the audience clearly demonstrated that they found these statements difficult to believe. We all must wonder what these foreign investors will think of this statement once they hear about it. This is certainly not the government spin they are delivering via people like Ethiopian Ambassador Gennet Zewide in her recent interview on an Indian TV program. (Please see: http://www.youtube.com/watch?v=gsFyIeVD108&feature=related and SMNE Open Letter to Gennet Zewide: http://www.solidaritymovement.org/100930OpenLetterToGennetZewide.php). On another note, on October 2, 2010, Ezega News reported that the Meles regime was now freezing—at least temporarily—further land deals; claiming it was a decision made a month ago. He admitted that it would confuse some. He said this as they leased 129 more hectares to billionaire Al Amoudi. 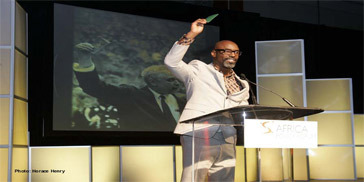 Isaiah Washington was one of the very well known African American celebrities attending this conference. During the session, “Dual Citizenship: Bridging the Ties between African Americans and Africans,” Isaiah Washington gave an eloquent and inspiring speech, saying he was the first African American to receive a dual passport; as a citizen of both the United States and Sierra Leone. He explained that he had spent $1.3 million in the past to get his DNA analyzed and found out his ancestors had originated from Sierra Leone. Through this information and much personal effort, he was finally able to obtain a Sierra Leone passport. Since then, he has become involved in Sierra Leone, trying to make a difference. He shared that ever since he was young; his heart has been in Africa. He said he wanted to go back to the mother continent and encouraged others to get their DNA analyzed to do same. with Rev. Leon H. Sullivan behind him in the same pose! He then urged in an impassioned speech, “I think we should rally and work with this kind of model. All of us should join together around these principles and revolutionize the continent with principles of putting humanity before ethnicity or anything else. Whether you are from West Africa, East Africa, North Africa, Central Africa or South Africa; whether you have light or dark skin; whether you are Muslim, Christian, Nigerian, Ghanian, Ethiopian, or something else, we all fit under the category of humanity first. Enough with the talking about it! As far as I am concerned, I am already in the struggle and I will do whatever I can to stand behind their movement; a movement to get us back home. As Obang said, it is a movement to restore a broken bridge between the mainland and African Americans. As Obang also said, there is no us and them. So let us help Africans establish a good government that respects the rights of all people and that protects the rule of law so people can go home. Let us support this kind of movement. I will work with brother Obang and people like him.” When he ended, the people stood up and gave him a standing ovation. Mr. Obang said that a highlight of the trip to Atlanta was meeting Ethiopians from the Atlanta area at Meskerem, an Ethiopian restaurant. During the discussion, the people agreed that despite the disappointment with the struggle, “we have to move on.” Ato Merid Bekele summed it up. He said if you asked any Ethiopian if people want unity; they will say yes. If you ask them if they want a better government, they will all say yes. He went on with other similar questions; pointing to the truth that most Ethiopians want change, but are not sure how to fix the problems before us. However, he summed it up in saying that we cannot ignore the things going on in the country and the fact that people are dying. People agreed that as a group, they must try to bring everybody together in Atlanta to speak with a louder voice. Mr. Obang agreed that there were some negative obstacles, but also some positive indications. The negatives were that many people were losing hope and distancing themselves from the problems in the country; however, the overwhelming positive was that there were Ethiopians like those present who were sitting down around a table to talk about what to do; refusing to quit. He said he believed there may be a million more Ethiopians like them throughout the world who cared and who were willing to not quit; however, the difficult task that we have failed to accomplish is to connect these people, who think alike, together to form a common vision that will lead to a powerful movement. Mr. Obang went on to say that if we can find a mechanism to connect us all together; mobilizing the people, it would be the end of Woyane. He urged that people should work with the organizations they believed in and then join in collaboration with others. As for the SMNE, Mr. Obang assured them that the SMNE was willing to work with everybody and that the goal now was to “be” a movement of the solidarity of people to people; reaching out to others who believed in the core principles of the SMNE—“humanity before ethnicity” and that “no one will be free until all are free.” The meeting concluded with the understanding that the SMNE will be there to help them. This ended a great evening between brothers and sisters of Ethiopia in Atlanta. Mr. Obang gives his gratitude to those Ethiopians who supported his attendance at this premier international conference on Africa; for it was a most worthwhile experience, filled with many new connections and possibilities. One thing that was definitely clear was that Ethiopians need to reach out to our African American brothers and sisters; helping them to find ways to become more engaged in African issues like the way it was done in South Africa. They are ready and so are we, but our first shared task is coming together and then working towards creating a healthier, freer, more just and more reconciled society in Africa. We Ethiopians must work harder to get our message out to outsiders so they can stand side by side with us to fight against tyrants who are a threat to all humanity. Like Martin Luther King, JR said, “Injustice anywhere is a threat to justice everywhere!” May God strengthen the bonds of these new relationships; empowering us to reach out to one another in ways that will help our African continent to become a blessing to the world!